Byron recently posted an aged picture of two men with bicycles strapped to their back. 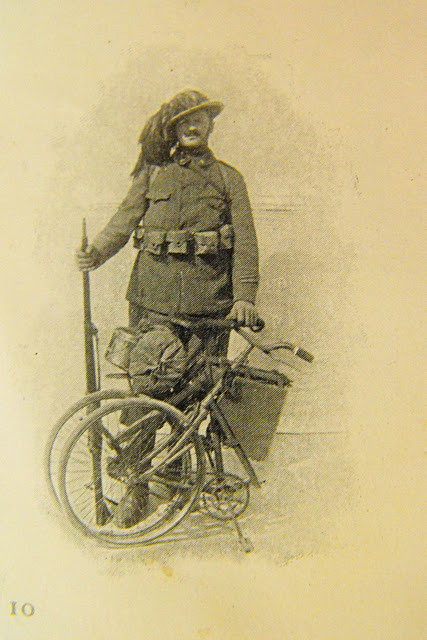 I recognized the photo from somewhere as being WWI Italian soldiers, and in my net search to verify I came across the webpage of The BSA & Military Bicycle Museum. One hundred years ago, shortly before Serbian nationalists assassinated Franz Ferdinand, this Bianchi Model 1912 was ordered by the Italian military to equip their Bersaglieri, or light infantry units with an emphasis on high mobility. At the time, Bianchi made 45,000 bicycles, 1,500 motorcycles, and 1,000 cars yearly. 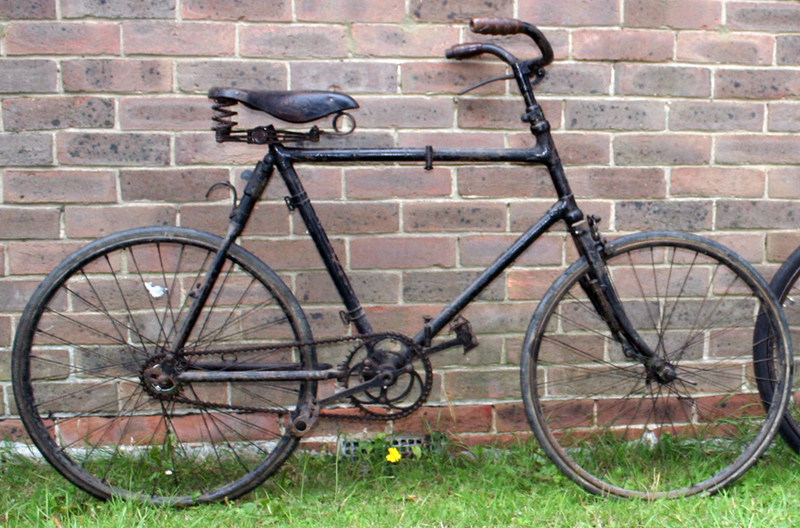 This Model 1912 was a fairly ambitious design, incorporating front and rear suspension on a folding frame. After WWI, Italia expanded the number of bicycle troops as part of tactical commitment to mobile warfare (as opposed to the stalemate of WWI trench warfare), though those divisions converted to motorization before WWII. BSA Bicycles were a well-known, quality brand in the United Kingdom from the beginning of the bicycle until the company sold bicycle assets to Raleigh TI in the mid-1950s. The company came about from the consolidation of several munitions factories in Birmingham that came together to meet a critical British shortage during the Crimean War, eventually selling rifles to a handful of countries. In 1880 with military arms sales flagging, the Birmingham Small Arms Company diversified into bicycles since the industrial processes of guns and bicycles apparently had a lot in common. BSA’s bicycles introduced many innovations that paved the way for cycling’s popularity, while simultaneously serving as a critical supplier of military arms during the two world wars. Besides guns & cannons, bullets & bombs, bikes & bike parts, BSA seemingly had a role in every British machine that moved in the first half of the 20th century, including Daimler (autos, engines), Triumph (motorcycles), and de Havilland (aircraft). BSA’s story bears similarity to that of Spanish cycle manufacturer Orbea, which also had a start in small arms in 1840 before building bicycles. 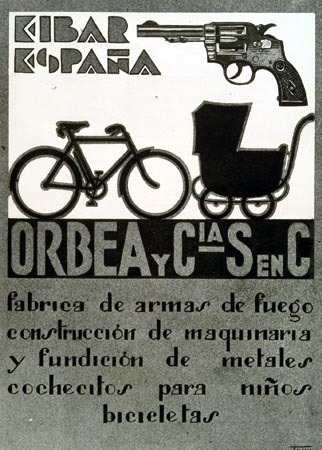 Orbea’s transition to bicycles had more to do with Fascist dictator Franco’s policy of dismantling regional autonomy and arms production; the Basque company was prohibited from manufacturing weapons during the 1930s. It is often said that bicycles today are soul-less products for mass consumption, but perhaps we are deluding ourselves if we romanticize the history of the bicycle. If we can only approve of a bicycle if is handcrafted in some one-man shop, then we should admit that we want luxury artisanal goods. Bicycles are as much an industrial product as automobiles, aircraft, sewing machines, and machine guns.